And would re-thinking how we classify workers avoid these sorts of problems? In light of recent Uber rulings, what's the best way for tax professionals to advise their clients? We focus on three points of view to answer this question. First, how should tax professionals advise entrepreneurs who are building a shared economy platform based around dispatching independent contractors? Second, how should tax professionals advise individuals who are working through a shared economy platform and are being treated as independent contractors? Third, perhaps we need to change the way workers are classified and treated from a tax perspective? We explore alternative ideas to see if any of these might make for the sharing economy. The case in question, Uber v. Berwick, involved an Uber driver named Barbara Berwick. She asked the California Labor Commissioner to decide if she was an independent contractor (as Uber claimed) or if she was an employee (as she claimed). The Labor Commissioner ruled that Berwick was an employee, and as a result was entitled to be reimbursed by Uber for her out-of-pocket business expenses. There's more at stake than just one Uber driver getting reimbursed for job-related expenses. Employers are responsible for collecting taxes through payroll withholding and are responsible for paying half of Social Security and Medicare taxes, unemployment insurance taxes, and maintaining workers compensation insurance. Employers typically also provide tax-advantaged benefits to their employees, such as access to retirement savings and group health insurance. Paying workers as 1099 independent contractors has less paperwork, less administrative hassle, and lower tax costs than paying workers as employees. So there is always a temptation, whenever there's a grey area, to lean to the side of treating workers as independent contractors. Now, "Uber as already appealed," reports Robert Wood. So this case isn't over yet. In fact, this case (as others like it, such as a class-action lawsuit filed in Boston, another class-action lawsuit filed in San Francisco, and an administrative ruling out of Florida) raises significant questions for tax professionals. What role do tax professionals play in helping entrepreneurs who are building next-generation shared economy platforms? Entrepreneurs building a shared economy platform should talk to their attorneys first, and sort out the question of which workers they will treat as employees and which workers they will treat as independent contractors. That's the advice of Derek Davis. He is a certified public accountant who specializes in the shared economy. Then, the entrepreneurs should talk to their tax professional and get the relevant financial reporting and tax processes set up. Davis advises: "Don't just follow Uber's lead because each company is different and has their own set of specific tax and legal rules." This is solid advice practitioners can give to their entrepreneurial clients. "My value-add is [to] figure out the potential tax liability and the taxes they would be exposed to and their financial reporting obligations," Davis said. Tax professionals can help such clients set up the appropriate processes and systems based on the client's needs. That may include setting up payroll systems, systems for issuing 1099-MISCs, and/or systems for issuing 1099-K forms. Davis recommends that businesses get in the habit of "keeping clean documentation on the benefits and working relationship with the company and their respective employees (or independent contractors)." The benefit of good documentation is protecting the client's tax position. Once these basic systems and processes are put into place, "then you can move on to figuring out how to minimize your tax liability," Davis said. "Like building a home, once you have the foundation laid out, you can start building upon it." By the way, did you know the IRS has developed worker classification guidelines for specific industries? The IRS has in-depth guidelines for how to approach worker classification issues for the moving industry and for the taxicab and limousine industry (both pdf links). The limo industry guide does a very good job of explaining how the industry is structured, and how to approach worker classification decisions. Had Uber executives (and the attorneys and accountants who advise them) actually read the limo industry guidelines, Uber might have designed their network to steer clear of the worker classification issues they currently face. In other words, for accountants who advise entrepreneurs and startups, look to see what the IRS says about the industry your client is working in. This can provide you with a clues on how to advise your clients. When clients ask whether a worker should be on a 1099 or a W2, have them ask their attorney. If they don't have an attorney, have some referrals ready to give them. Tell them, once you sort out what the right answer is, we'll help you set up the proper systems and procedures to make sure all the taxes are handled correctly. Build tax planning opportunities on top of a strong foundation of process and recordkeeping. Accountants also work with individuals. Individuals who are working as Uber drivers are being treated as independent contractors. That means we are helping our clients report this income on their Schedule C and helping them deduct all the business expenses. 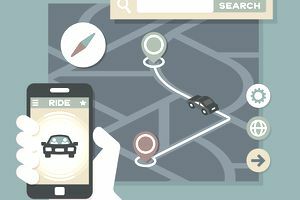 And not just Uber drivers: many people are finding work through shared economy platforms such as TaskRabbit and Thumbtack. Of course, each network is different and has its own unique features. But here's my point, quite often we are in a position to help our clients figure out whether they are truly self-employed. And, we have all seen it, sometimes our clients are being misclassified. The company they work for are treating them as independent contractors for tax purposes, but in reality the workers really should be set up as employees. Here's the advice I often hear other tax professionals giving their individual clients. "You really aren't working independently. You would be better off as an employee. You can file a complaint with the IRS. The benefit to you is you would pay less tax (as your employer would have to pick up half the Social Security and Medicare taxes). The downside is the IRS will investigate. And when your boss finds out, you will lose your job." And the client, who really isn't independent and doesn't have other clients he can rely on to help cover the slack, will be too afraid to stand up for his right to pay the correct amount of tax. This advice, while it is well-intended, perpetuates an injustice. His employer is unjustly forcing the worker to pay double FICA taxes and to pick up the tab for his expenses. And we are perpetuating this injustice by reinforcing the fear of losing a job, and thus losing the ability to earn money and put food on the table. Do we really want to keep our clients living in fear? Of course not. Is there better advice we can give our clients? How about this. We can help them understand what's going on with their tax situation. We can help them understand their options - here's what it means to be self-employed, here's how the taxes work, here's the recordkeeping you need to do. And show them the alternative: here's what it would look like if you were an employee. Let's show them - using real, hard numbers, what's really going on. We can explain that the IRS has a special department dedicated to helping people figure out if they are being mistreated, that the IRS can use their influence to help their employer do the right thing and start treating their workers properly. And then we can follow through by referring our clients to attorneys skilled in handling these sorts of cases. In other words, give the client all the information they need (without the implied threats of losing their livelihood), and just wait and see if our clients are courageous enough to stand up to this injustice. And if so, we'll be able to assist them in making their their taxes are done right and we shepherd them through the IRS procedures for determining worker status. And maybe our client won't pursue an IRS determination of worker status this year. Maybe our client will wait and see how these court cases play out. Maybe they will wait to see some favorable outcomes from the court cases before approaching the IRS. Here we need to be alert. What are we looking for? Why, the statute of limitations. We have three years to seek refunds of overpaid income tax and self-employment taxes. We should be informing our clients about these time frames, and help monitor the statute of limitations so we can file the Form SS-8 and amended returns within the appropriate time frame. Some commentators are calling for a third classification besides employee or independent contractor. Demid Potemkin, a strategic visionary for early-stage technology, argues that tax law needs to evolve to keep pace with innovations in the shared economy. "We need a new class of workers for a new economy; contractors who can retain their legal and financial independence even while relying on a single company," he writes. Davis disagrees. "I think that's a far-fetched idea. It's just wishful thinking, it's more dependent on, companies are trying to come up with this 3rd classification to protect themselves. It's not arising from some sort of need. [It's] to protect themselves from tax liabilities and [they] don't have to pay out extra benefits." There are other possibilities for either a third classification or a hybrid classification for workers in the shared economy. One direction we could take is to eliminate the distinction between employees on the one hand and self-employed contractors on the other hand. We could collapse this distinction and treat all people simply as workers. And we could design a tax system with just a single mechanism for reporting income payments and withholding any necessary taxes. Hybrid classifications are possible too. Already in the tax code we have the concept of statutory employees. Statutory employees are paid on a W-2, and have FICA taxes withheld (and employers pay the matching half of FICA taxes). But the income is reported on the worker's Schedule C, where they can deduct job-related expenses directly against this income. And there's another hybrid classification: clergy. Ministers, rabbis and other religious workers are treated as employees for income tax purposes (so they get a W-2), but they are considered self-employed for Social Security and Medicare taxes. That means, unlike any other employee, clergy are required to pay both halves of FICA. And there's a fourth option. Look at how real estate agents are treated. It's literally written into the tax code that real estate agents must be independent contractors. This is a rare and perhaps unique example where the tax code specifically states how a particular type of worker is classified. If proponents of the shared economy are seeking a third classification, perhaps they can look to these four alternatives to see if one suits their needs.